Please choose your colour scheme - balloons, streamers, paper flowers etc. Matching Baby's outfits will be available to wear according to your selection. ● The all-inclusive Photo Shoot Session of $395 covers the time & skill of the photographer, Karin Shugrue, taking the images, the professional editing of photos and the supply of 40 high-resolution files on a USB stick. The package does not include any products, prints or photographs. ● The Photo Shoot Session fee must be paid in full to secure booking if booking date is less than 1 month from the session. ● A Booking Fee of $150 must be paid to secure booking if booking date is more than 1 month from the session. The remaining $245 is due 3 days before the session. ● The Photo Shoot Session fee is non-refundable. If you cannot make your appointment, please let KS PHOTOGRAPHY know as soon as possible so that it can be re-scheduled. Non-show will forfeit the fee. ● All prices are subject to change without notice but will be honoured once the booking is complete. ● The pricing of the Cake Smash is already very competitive. 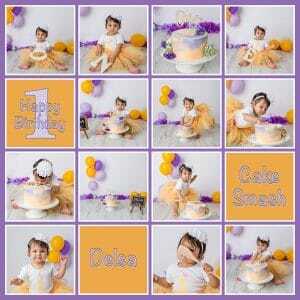 Unless specifically specified, no other discounts or promotions can be used towards the cost of a Cake Smash Session. ● KS PHOTOGRAPHY has exclusive copyright of all images created and has therefore the right to make reproductions. ● All images purchased as Digital Files obtain Shared Copyright Status and clients are permitted to print, share and copy those images. When shared in social media, it would be appreciated if Clients mention "KS PHOTOGRAPHY" as the creator of the photograph. ● Images may not be sold or published to commercial companies or institutions. For publishing in newpapers or magazines, prior permission by KS PHOTOGRAPHY MUST be obtained. ● Images may be used for the photographer's personal portfolio, professional competitions or peer reviews without client's explicit permission. Please be assured that under no circumstances will your images ever be sold, published or passed on to other companies or organisations.